This is another one of my impulse buys from the internet. 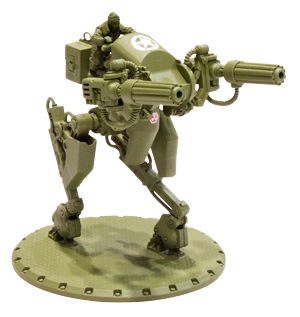 I had seen a few photos of this model on various forums, but didn't realise that it was a war game piece from the Dust Tactics range. I am not a war gamer but the figures and machines always fascinate me. Anyway a quick look around the web and I found this advertised for sale on Amazon. A few clicks later and it was on its way to me. When it arrived, I was amazed to see that it is supplied as assembled and painted on its own base as the first picture shows. A little let down as I was keen to build something like this, I sat in my garden, lit a cigarette and began to formulate a plan to alter it in some way so that I could glean some enjoyment from this little model. Aha, I thought to myself, I have just finished building an LRDG Chevy truck and SAS jeep, I wonder if this would look good as a desert assault walker. A plan in mind, I set about striping as much as I could from the model including the figure and base. I then painted the majority of the panels in a desert yellow colour and the machinery sections in matt black. I also didn't like the size on the figure (probably because I usually work in 1/35), so I removed the existing small seat and replaced it with a motorbike seat from the spares box along with a figure from my spares box that I highly modified to fit onto the machine. The head is a hornet resin head with an added eye patch because I thought that it would make the driver look cool ! I also added a few other bits and pieces such as a ruck sack to the front of the machine and some bed rolls, weapon and helmet to the rear. I added some simple decals in the form a number four and some small decals for the top of the weapon. For the base, I added a simple sand base and nothing else, the whole machine was weathered to reflect constant use in the desert and a liberal amount of oil and paint chips added. I am really happy with the result and I personally think that it looks a million times better than the supplied model. I would love to hear your thoughts on my interpretation of the Dust Tactics Assault Walker.